Paul Burgett’s career at the University began in 1964 when he enrolled as a student in the Eastman School of Music. He eventually became dean of students at Eastman, and then vice president at the University and senior presidential advisor. For more than 30 years, Dean Burgett has inspired incoming students with his “fiery furnace” talk, which can be described as a one-man morality play about the college experience. According to Dean Burgett, we must all enter the fiery furnace, a metaphor describing the challenges and obstacles that each student inevitably encounters—and overcomes—in the process of earning his or her degree. As only he can do, Dean Burgett captivates students with his energy, enthusiasm, and humor on the topic of academic pursuits. One of the University’s oldest and most beloved traditions, the Boar’s Head Dinner began in 1934 and is held annually in December. The dinner recalls the spirit of English court dinners, such as those served at Queens College, Oxford University, during the Middle Ages. Legend has it that back in 16th-century Oxford, a scholar of the College was strolling in the woods when he was attacked by a wild boar. A student rescued him by stuffing a copy of Aristotle down the creature’s throat. The boar choked to death on the “dry stuff,” and our hero saved the scholar. The student bore back the boar’s head in triumph, and the College instituted the custom in gratitude for the scholar’s rescue. For the first 40 years, the dinner was an all-male event. In 1971, members of the University’s Women’s Caucus wrote a letter to the editor of the Campus Times expressing discontent over the event’s gender discrimination. Thereafter, the dinner became a coed event. Today, Rochester students borrow the ceremony of the boar’s head for their winter feast. The celebration begins with a trumpet call and procession of students, faculty, and administrators clad in medieval costumes. The multi-course dinner features performances and entertainment during the meal, including songs before each course is served. More than 500 students, faculty, and staff currently attend the holiday feast. Tickets are limited and the event sells out every year. Tunnel travel has been a way of life at River Campus since the early 1930s. The earliest navigable tunnels were under Rush Rhees Library and the academic quad; tunnels between Hoyt, Schlegel, Meliora Hall, and Wilson Commons were added later. Their main purpose is to protect students against Rochester’s winter weather conditions. But painting the Eastman Quad tunnel has become an important part of campus culture. 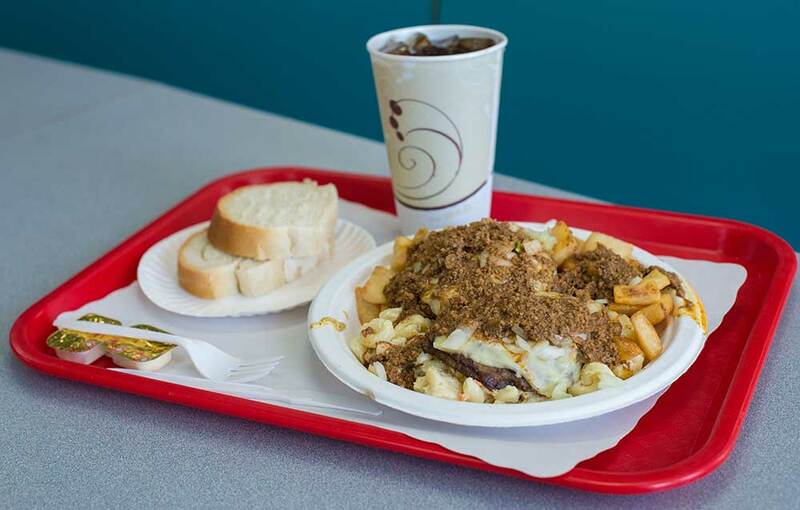 The custom originated in the early 1970s. Students would leave their mark by creating, posting, and affixing aphorisms, exhortations, slogans, and elaborate artwork. Today, painting the tunnel walls is often a group activity for Greek organizations, class councils, and groups hosting special events or raising awareness. Painting of profanities, obscenities, or hate speech is not tolerated. A group must not paint over another group’s work before the event advertised has occurred. No spray painting in the tunnels (because it is an enclosed space). 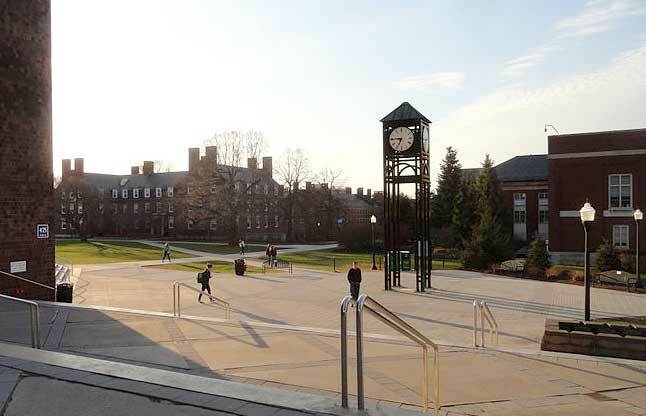 You’ll find the clock tower (erected in fall 2000) in Dandelion Square, the area between Wilson Commons and the Goergen Athletic Center. The superstition about the clock tower is that if you walk under it and tread on the dandelions, something dreadful will happen to you. For example, if you’re a prospective student, you won’t be admitted; if you’re a current student, you won’t graduate on time. 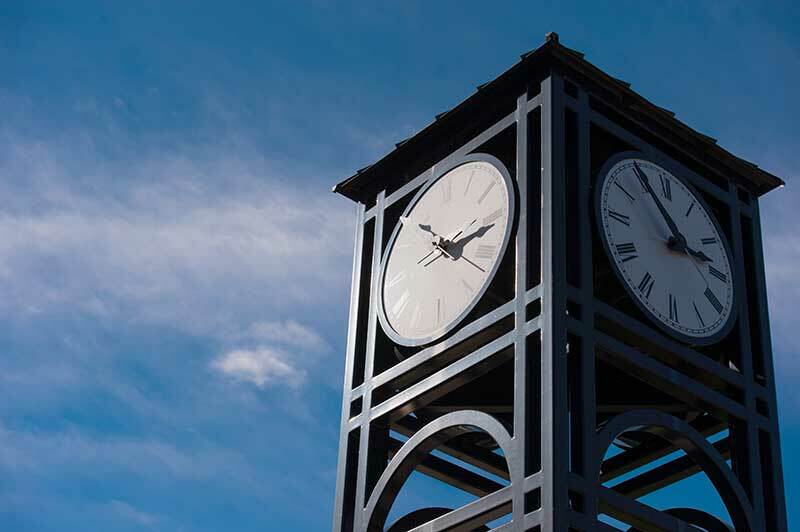 So walk under the clock tower at your own risk. If you accidentally tempt fate, there is a way to avoid catastrophe. You’ll need an acorn, a statue, and good aim: Throw an acorn at the statue of George Eastman in the quad and have it land in the brim of his hat. You are then absolved. But stock up on acorns just in case you forget to watch where you’re walking. Wilson Day is celebrated each fall. It honors the civic spirit of University benefactor and Xerox founder Joseph C. Wilson ’31. As part of their first week on campus, freshmen and new incoming students take part in community improvement projects and work for community service organizations in and around Rochester. Read more about Wilson Day. Started in 2010, George Eastman Day is celebrated each fall during the Eastman School of Music’s undergraduate orientation. 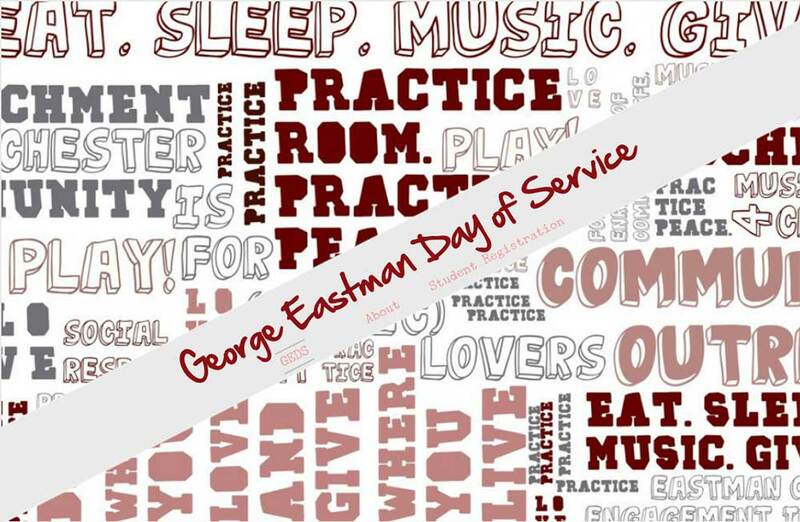 The day commemorates industrialist and philanthropist George Eastman’s commitment to community enrichment. His commitment lives on today in the School’s extensive volunteer efforts. The day’s activities encourage volunteerism and future student involvement in community outreach and engagement projects. Approximately 200 members of the Eastman community volunteer at organizations throughout Rochester. Learn more about George Eastman Day. 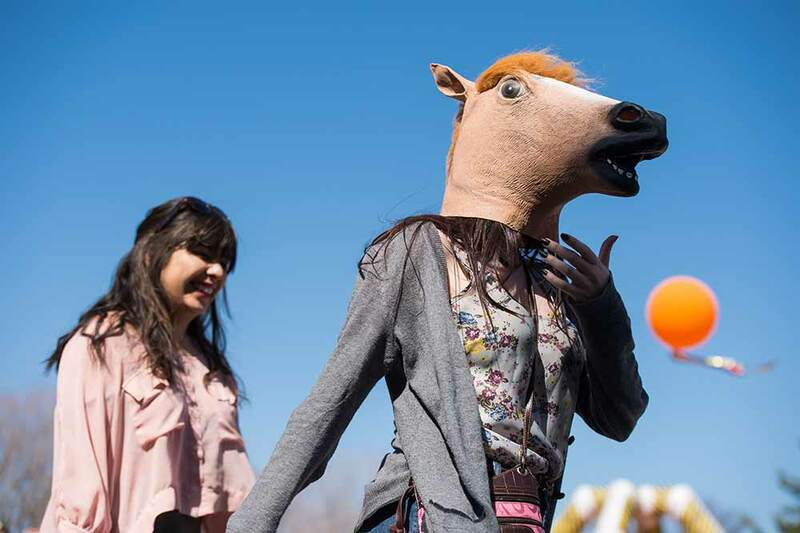 Bookending the start and finish of the academic year are Yellowjacket Weekend (which began in 1976 as Yellowjacket Day) and Dandelion Day, two of four current college community weekends. The holidays welcome students in the fall and offer a final fling before exams in the spring, respectively. Dandelion Day began in the early 1950s and may have been inspired by 19th-century Field Days, in which participants showed off athletic prowess in various outdoor sports and events. The close-of-classes holiday originally coincided with the blooming of the dandelions. In the early days, activities included freshman-sophomore tug-of-wars and a parade, barbecue, and dance. Today both celebrations feature more contemporary entertainments, such as amusement park rides, festival food, and street performers. 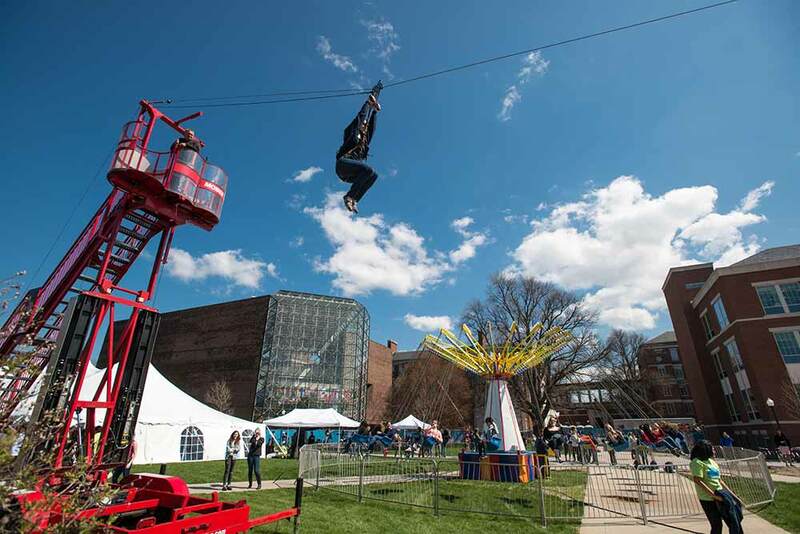 Dandelion Day is now part of Springfest Weekend. The first boulder turned up in 1967. As construction crews excavated for a major expansion of Rush Rhees Library, they found a 10-ton rock that had been formed by a shallow sea that covered the Rochester area 400 million years ago. Trustee and alumnus Robert Metzdorf thought the rock worth preserving on campus. With the president in agreement, a crane deposited the rock in front of Susan B. Anthony Hall. The second boulder turned up during excavation of the basement of the Health Services building in 2007. The 1967 boulderhad been moved temporarily for that construction. The two were then placed in the grassy circle in front of the residence hall. 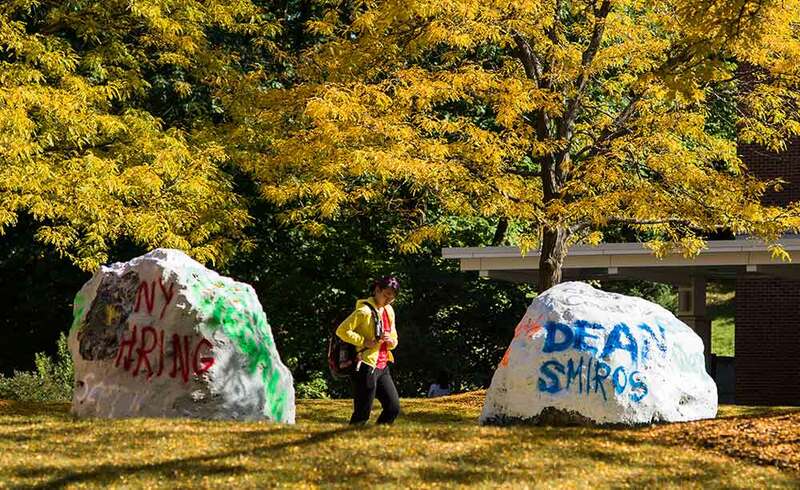 Today, students often paint the rocks to reflect and promote current events. 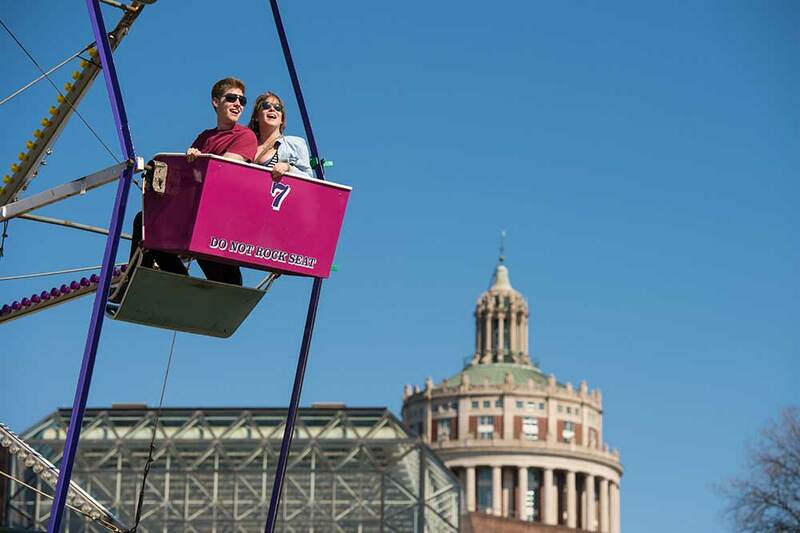 Meliora Weekend was founded in 2001 following the previous year’s successful sesquicentennial celebration. 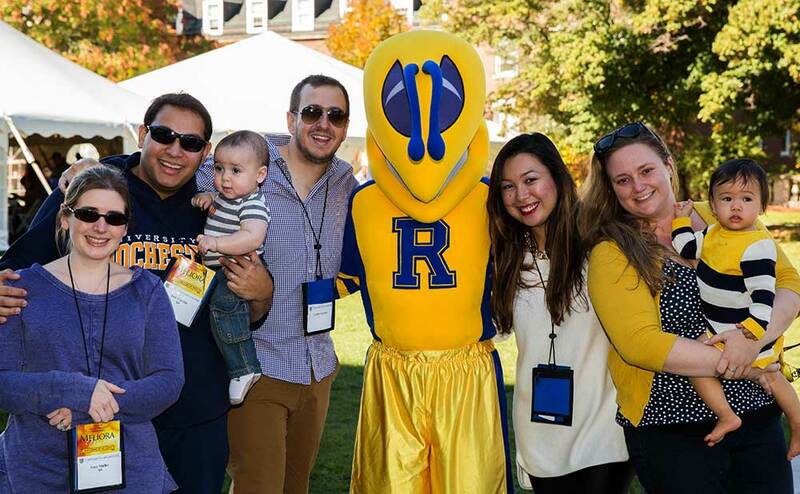 The weekend comprises reunions, family weekend, and homecoming activities, and it welcomes alumni, parents, students, faculty, staff, and friends of the University of Rochester. Events include a range of programs such as major speakers, entertainment, symposia and panel discussions, reunion events, sporting events, seminars, open houses, and more. 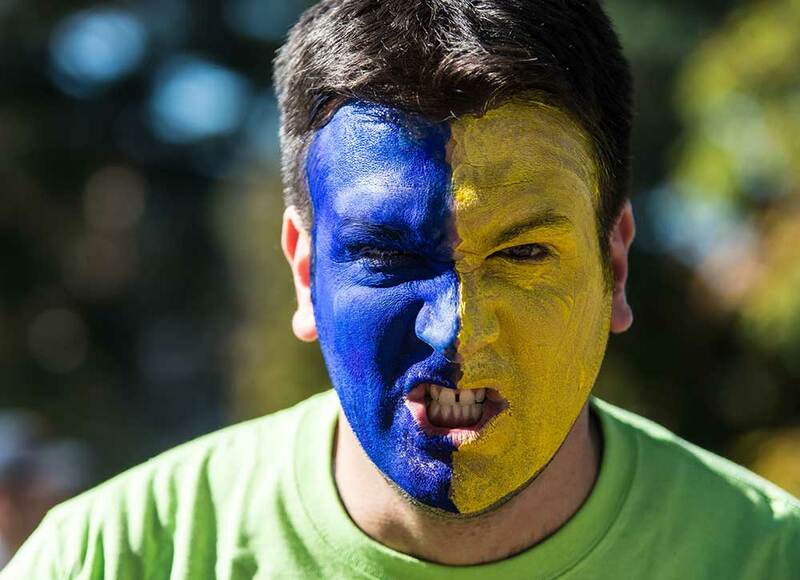 Learn more about Meliora Weekend. For many years, traying down the Susan B. Anthony hill was a Rochester pastime. With the first real snowfall, students would borrow trays from the dining hall and use them for sledding. Other traying spots included the hill by Danforth Dining Hall or the one near Anderson Tower. But increased sustainability efforts on campus portended the activity’s end. For Earth Day in 2008, Danforth Dining Hall went trayless in an effort to decrease waste production. 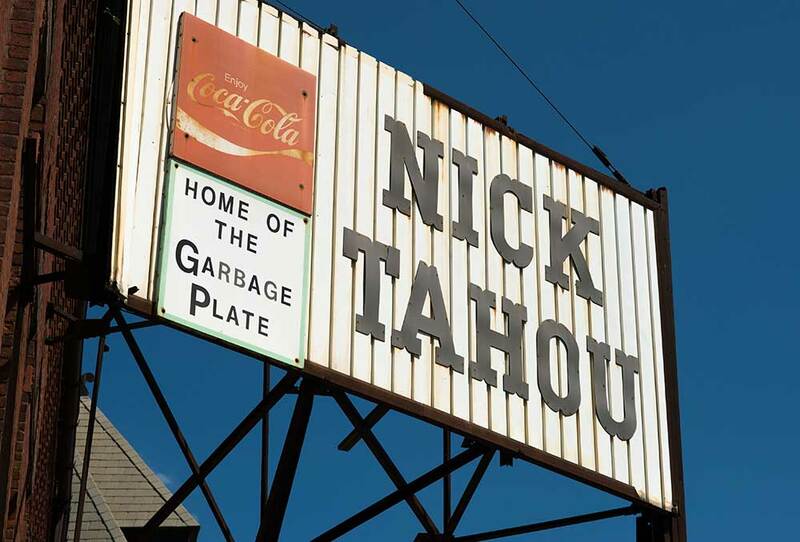 The event was so successful that trays were eliminated in Danforth entirely, resulting in less water, energy, and food waste. Then in 2010, Wilson Commons also stopped using dining trays. With that, River Campus became trayless, marking the end of a beloved tradition. Students who wish to sleigh down the campus hills today must resort to conventional sleds or toboggans. Knock-off plates are abundant in and around the city.